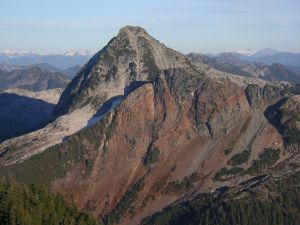 Tetrahedron Peak is an impressive peak, the highest on the Sunshine Coast. Although one might think it could be easily climbed from the Tetrahedron Plateau on the west, it is actually a long way from there, and parties would have to do a fairly big drop to get to the mountain. From the east, it is mostly a steep and terribly bushy scramble up from the Rainy-Tetrahedron Col.